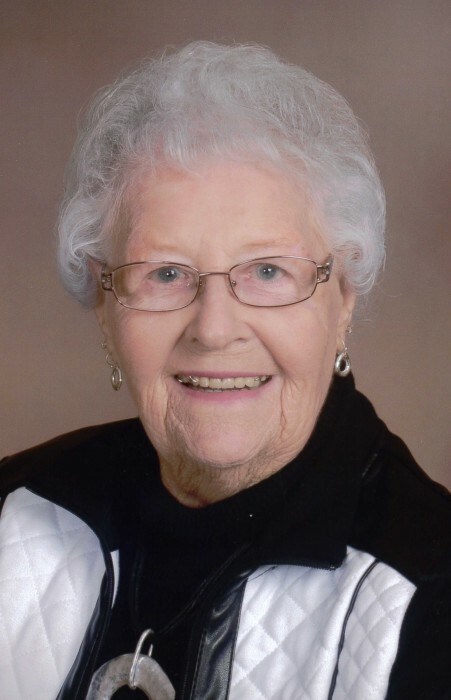 Mary Alice Kiefer, 90 of Portage, passed away with family at her side Wednesday, January 23, 2019. Mary was born August 5, 1928 in Portage to Irish parents, Frank and Gabriella (Kearns) McCoy. She was always so proud of her Irish heritage. She graduated from Portage High School in 1946 and worked at Atkinson’s Department Store after graduation. She married her high school sweetheart, Howard Kiefer September 4, 1948 at St. Mary’s Catholic Church in Portage. The newlyweds moved to Howard’s family farm where they farmed until retiring. Mary was a member of the St. Mary’s Catholic Church in Pardeeville, the CCW at church, and a member of the Marcellon Homemaker’s. She made many beautiful quilts and blankets, enjoyed card stamping, and playing cards with her friends. Mary enjoyed her life as a homemaker and especially the times with family and friends. Mary is survived by a son, Lawrence “Larry” (Sandy), granddaughter Courtney (Ted) Krueger and grandson Christopher (Melissa) Kiefer. She loved being called “GiGi” by her three great-grandchildren Gracie Krueger, Cullen and Cayson Kiefer. Mary was also survived by a brother Thomas (Audrey) McCoy; niece Heather (Bart) Milton, their children Cole, Sydney, Cade; nephews Chandler (Stephanie) McCoy, their children Finn and Cooper and Keith McCoy and many relatives and friends. She was preceded in death by her parents; husband Howard October 7, 2014; father and mother-in-law William and Thekla Kiefer; brother and sister-in-law, Jack and Frances McCoy; and brother-in-law, William Kiefer. Mass of Christian Burial will be held Saturday, January 26, 2019 at 11 AM at St. Mary’s Catholic Church in Pardeeville with Reverend Mark Miller will preside. Visitation will be held from 9:30 AM until the time of service at the church. In lieu of flowers, memorial may be made to St. Mary’s or Agrace Hospice. The family would like to express a special thank you to Dr. Brenda Blohm, Agrace Hospice Caregivers, especially Megan, Kim, Natalie, Amy and others for their kindness and support. The staff at Tivoli who gave her special care for the one day she was there. May you all be blest.